Having spent two years living and serving in Malawi, I feel like I had very realistic expectations about what my experience would be like volunteering at Kamuzu Central Hospital (KCH) in Lilongwe. Having two Malawian sons, I feel that my love and compassion for the people in the country is deep and personal. The hospital, while it has made some improvements, continues to be grossly understaffed in terms of medical personnel. The resources available for the diagnosis and treatment of childhood conditions remain heartbreakingly inadequate. In my short time there I saw more pathology and a higher acuity of patients than I have seen in a year of Pediatric Emergency Medicine fellowship. Despite the fact that it was the dry season when I visited, malaria was the most predominant presenting chief complaint, followed by oncologic processes, often having reached a stage of progression that simply is not seen in the US. Perhaps the hardest part of working in this setting is the inability to treat the suffering of the children. There are few, if any, pain medications available, and it was wrenching to witness pediatric patients in agony from trauma or disease and be unable to help them. The contrast with the services available for children in the US is stark and unjust. My recent time at KCH has reinforced my commitment to creating a career path that enables me to continue to return to Malawi. I am so fortunate to have been given the grant from your fund, and so grateful for the opportunity to provide some relief to the physicians there and care for the children of the community, however briefly. 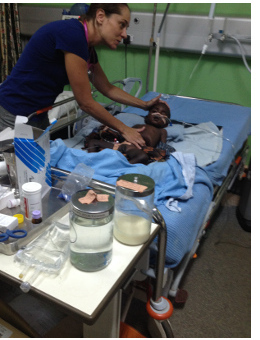 Thank you for providing the resources to enable medical providers to travel to places in need. It is now a month after the return of our week-long trip to Haiti. Although I've returned to work and the life I was living before, the images of each moment I experienced still flash through my mind quite frequently. I remember their faces - their smiles, their wonder, their gratitude. I remember their homes, their lifestyle, the simplicity. I wonder how they are today. There were a few children I really worry about. I hope that the medications and instructions we provided were able to save their lives and that they are healthy today. One young boy I cared for was sick with pneumonia. He came back to us 3 days in a row so that I could see him each day and give him more medication. I caught a glimpse of his father on the day we left and he smiled, told me the boy was doing much better, and thanked me. But I worry about the ones I didn't get to see again. Are they better? Worse? Here in New Jersey, every single patient encounter is concluded with "if you have questions or concerns, just call us or come back at any time." This was the luxury I missed the most. So I just keep wondering if they are okay. Hands Up for Haiti is one of the most incredible organizations I have ever worked with. They are genuinely providing quality care to people in great need. They strive to provide sustainable care through improving healthcare centers and establishing follow-up programs. I would be honored to work with them in the future and am privileged to have had this opportunity.